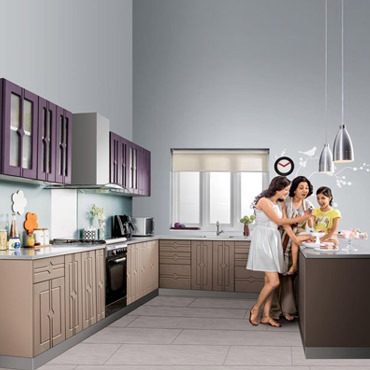 Godrej is the only company in India which offers Modular Kitchens, made entirely of steel. Why steel? Steel can be post formed to very high tolerance, with great accuracy, and ensures tight joints, which does not allow any insects to invade the inner space. Then, there is the ease of maintenance, as all it needs to bring back the pristine look, is just a wash with warm soap water. Lastly, no other product can ensure a lifetime of service, with virtually no maintenance, and no down time. 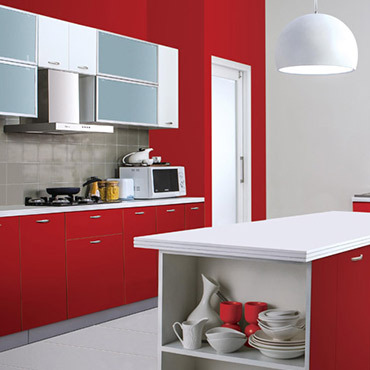 The base, or carcass in our parlance, of a Godrej Modular Kitchen, is entirely powder coated steel. However, the shutters, the most visible part of the kitchen, comes in different forms. 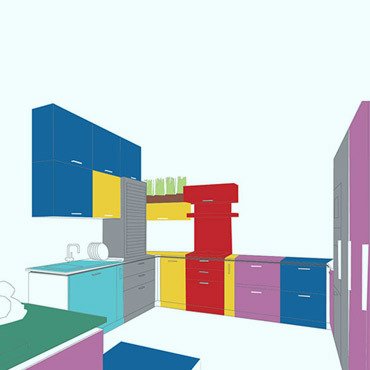 Below, we take you through the entire range and colours, of all that Godrej Modular Kitchens have to offer. Medium Density Fiber board 18mm thick shutters wrapped in durable foil eliminating moisture penetration and peeling. The marine ply shutters are constructed with 16 mm BWP marine ply with 1 mm laminate on both sides. The shutters have a matching 2 mm matching lipping on all sides. These are basically used in interior decoration to impart the sleek, glossy, ultramodern look. 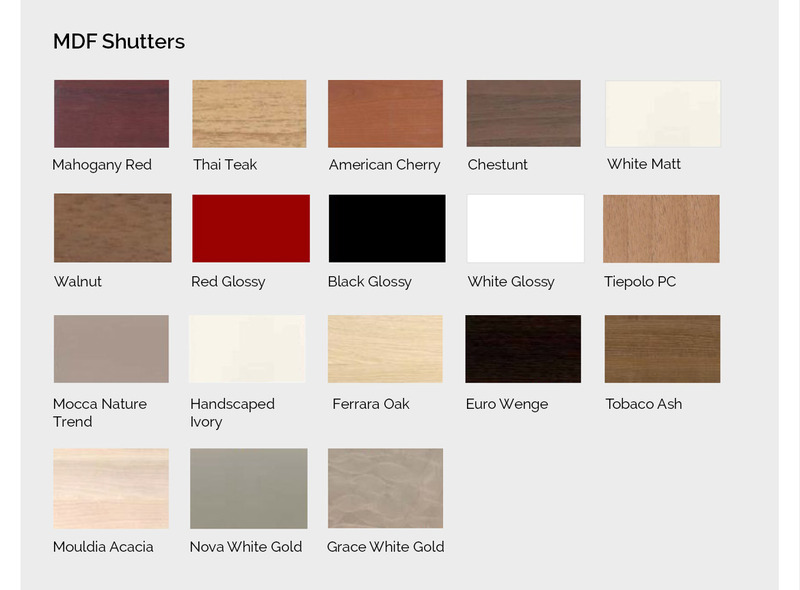 We offer kitchen with PU Shutters, in bright, sober and a combination of colours. PU coating on marine ply is a wonderful paint finish, which provides a touch of the modern world. Embellish your spaces with quality and designs that gel beautifully to deliver interiors that exhibit an extremely sophisticated and contemporary look. As food articles are stored inside the cabinets, it is most important to have these safeguarded against pests & micro-organisms. Godrej kitchen cabinets are made of galvanized steel, which, by its property is a cold surface & does not allow micro-organisms & pests to survive or breed. Steel, unlike wood, does not absorb / retain moisture from the atmosphere. Galvanized steel is used for making the cabinets, which offers the highest resistance towards water & also does not rust because of phosphating & powder coating with special encapsulated epoxy polyester powder. In interest of safety, it is important to have kitchens made out of a material, that is fire retardant. Steel by its property doesn’t catch fire. Longevity of the kitchen depends on good screw holding capacity, for the carcass to ensure that the shutters & accessories remain intact even over a long period of use. Godrej cabinets have threaded holes for fixing the accessories & shutters,and this ensures that the screws continue to remain tight and perfectly aligned. Godrej kitchens are designed to carry heavy duty loads. The steel carcass and shelves have 80Kg bearing capacity, and the pull out accessories at 15 kg. Steel Shutters: - Post form look steel shutters using 0.6mm thick Galvanized steel and ABS end caps. MDF Shutters: - Medium Density Fiber board 18mm thick shutters wrapped in durable foil eliminating moisture penetration and peeling. 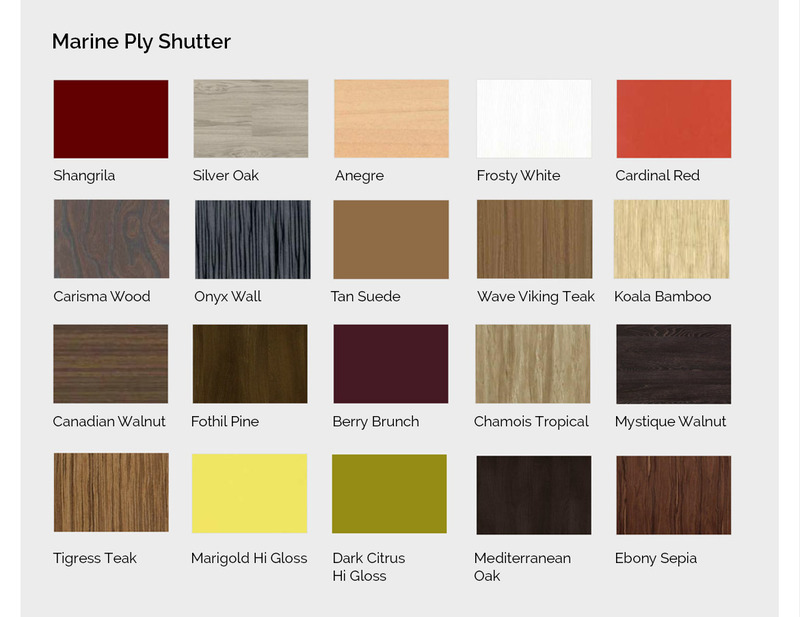 Marine Ply Shutters: - The marine play shutters are constructed with 16 mm marine play with 1 mm laminate on both sides. The shutters have a matching 2 mm matching Lapping on all sides. Cabinet (frame) Material: - Combination of 0.6mm (Body panels) and 1.2mm thick (Horizontal frame) Galvanized sheet with zero spangles. Finish on metal surface: - Epoxy polyester powder coating with dry film thickness of 40 – 60 microns. Wire baskets: - Made of top quality grade Stainless steel wires with Ni Cr plating. Shelves: - Galvanized steel shelves in case of metal hinged door unit. Slides: - High precision Godrej made double extension ball slides. Hinges: - German hinges (Hettich) with CED coating for extended corrosion resistance. Skirting: - Poly Vinyl Chloride skirting.